What is the ATOM Project? “Wherever I have been, I always say with pride that I live in a country that was one of the first to give up nuclear weapons,” Kazakhstan’s famous painter and anti-nuclear activist Karipbek Kuyukov told EURACTIV in an interview. 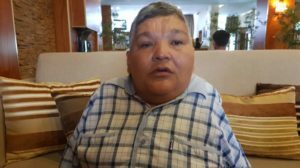 Karipbek Kuyukov was born without arms, as one of the many victims of nuclear radiation in Kazakhstan. He paints holding the brush in his mouth. He has devoted his life and art to making sure that no one else suffers the devastating effects of nuclear weapons testing. Kuyukov is Honorary Ambassador to The ATOM Project. I was born in 1968 in the village of Yeghindybulak, which is a 100 kilometres from the former Semipalatinsk test site. Before my birth, my mother had children who did not live to their first year, there was a boy who lived only 6 months, then a girl was born who did not live up to 8 months. To read the full Euractiv interview, click here. Sign The ATOM Project petition to tell world leaders you demand a nuclear- weapons-free world. As the world’s citizens unite against terrorism in all of its forms, let us encourage the world’s leaders to negotiate a responsible end to nuclear weapons and deny terrorists the chance to initiate a catastrophic nuclear attack. The Atom Project is committed to eliminating the world’s nuclear arsenals. Sign our petition today and tell world leaders that you demand and deserve a world safe from nuclear weapons.